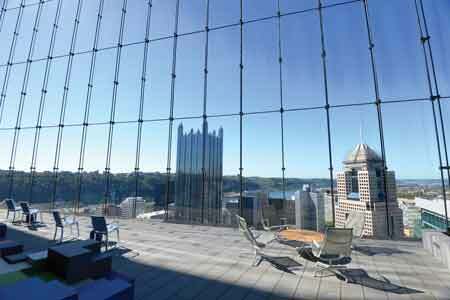 Part 3 of a 5-part article profiling the high-performance PNC Tower in Pittsburgh. 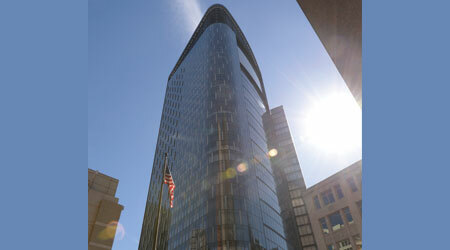 Any large, innovative system requires tweaks and offers surprises once it goes online, and the PNC Tower is no exception. The building, which only achieved full occupancy in January, has been a learning experience for the facility team. “I would say you discover something new every day,” Pease says, “and the design team knew that would happen. We planned for it.” A huge array of sensors and controls allows operators to understand sooner what is happening and adjust, he says. One surprise during the building’s debut has been the sun’s power. The solar chimney has been working according to plan, but Fusan says he’s been amazed at the amount of solar energy the building can receive even on a cloudy day, which he attributes to the roof design and to the ability of solar energy to penetrate cloud cover. Caption: The tower’s five-story-high Indoor Park, or atrium, offers fresh air and a panoramic view of downtown Pittsburgh from the 28th floor. The space is supported by a 100-foot curved steel truss. “Saturday (Feb. 20), we were at about 10 degrees, it was a sunny afternoon, and we were actually getting cooling demands from the southern exposure,” Fusan says. “What’s amazed a lot of us is what you can get out of the sun if you let the sun work for you.” He says the sun has influenced building operations more than he would have guessed, with less need for heating than anticipated, especially on the western and southern sides of the building. Operators have made adjustments to reduce terminal velocity noise at the chilled beams, to tweak air velocity through the building, and to revise opening-and-closing parameters on the poppers. PNC operators say it will take a year’s worth of data to quantify energy savings, though they point out that moving naturally ventilated air through the space without fan energy inevitably means energy savings. The emphasis at the tower is on doing as much maintenance work internally as possible. The operating engineers are trained to deal with nearly anything in the building that might need repair, Fusan says. Those engineers, Finegan adds, were brought into the tower’s design and construction process early on in order to build their knowledge, which is unusual. Caption: An estimated 91 percent of the tower is lit by natural light, including this office area. 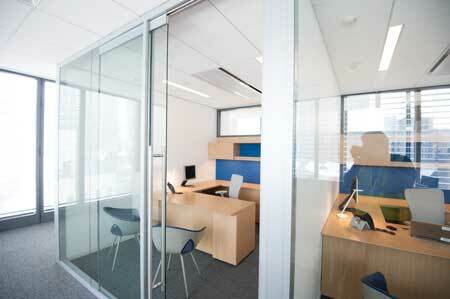 Light colors on ceilings and walls reflect natural light onto desks and into the building. Lighting controls moderate overhead lights if natural light is sufficient.